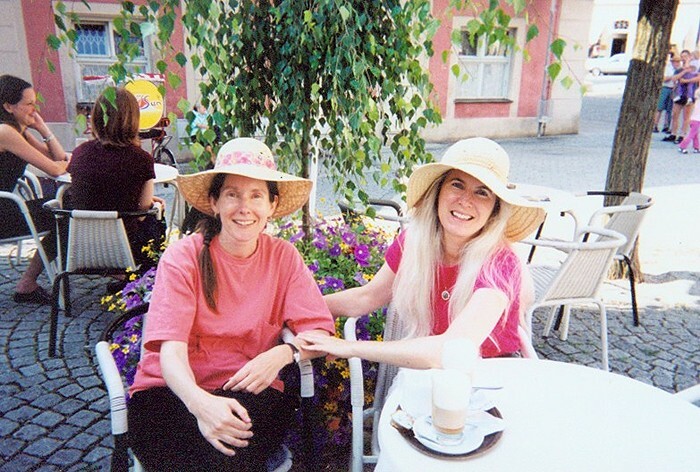 Catherine and Patricia enjoy the liesurely life the Cafe Paradise. 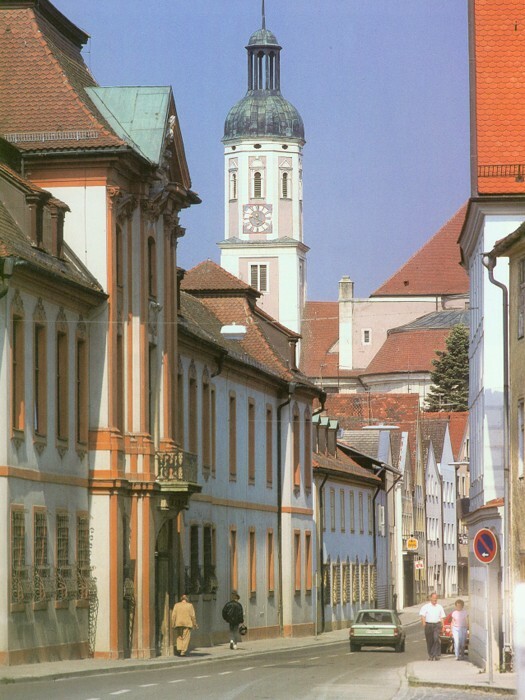 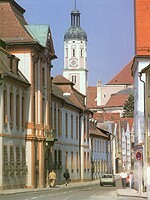 Enjoying beers with a view of historic Eichstaett. 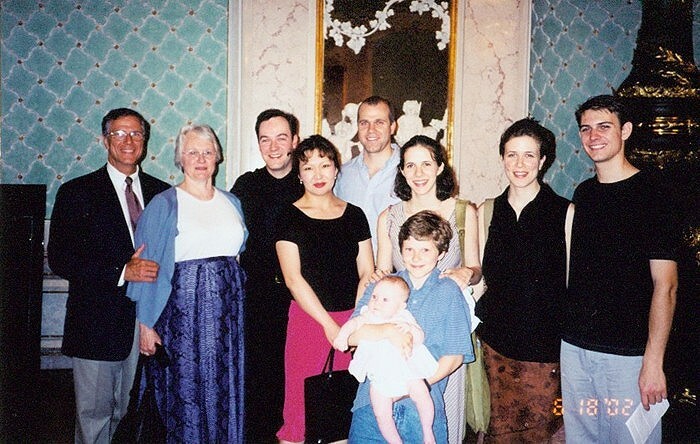 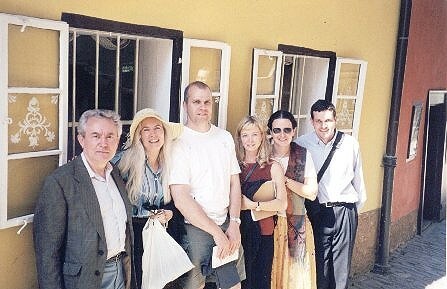 The Haas family with renowned Pianist Leon McCawley and his wife Anna at the Hall of Mirrors. 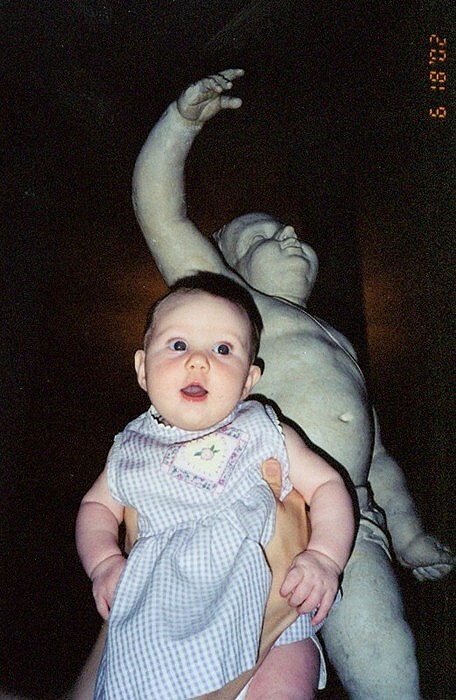 Greta Haas fakes a Baroque Putti at Eichstaett's Episcopal Residence. 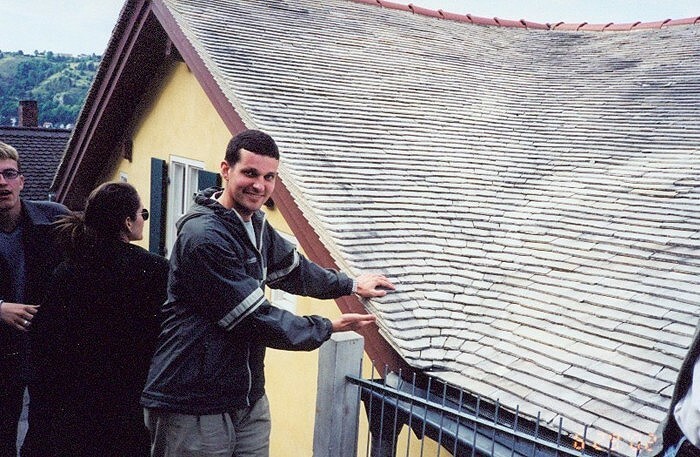 David Brown shows off German craftmanship on an Eichstaett house. 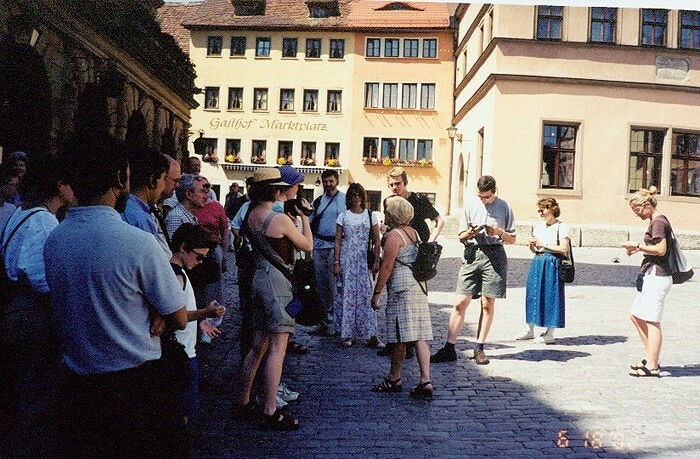 Touring Medieval Rothenburg. 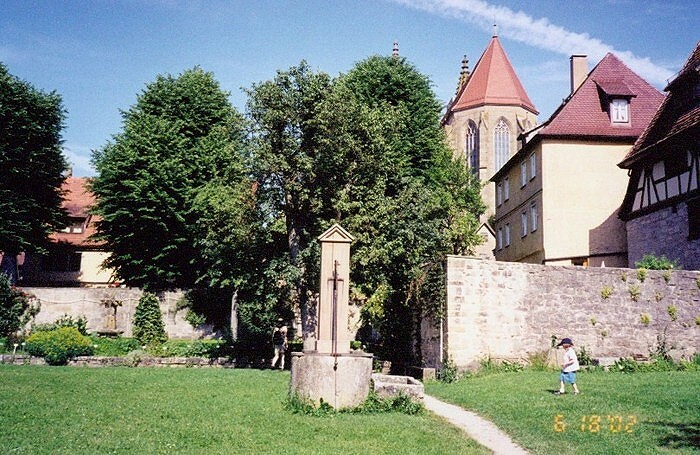 A scene of Medieval Rothenburg. 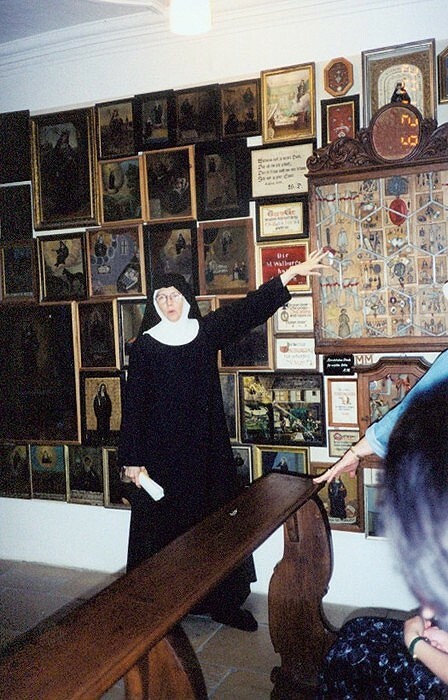 A tour of Eichstaett's St. Walburga Abbey. 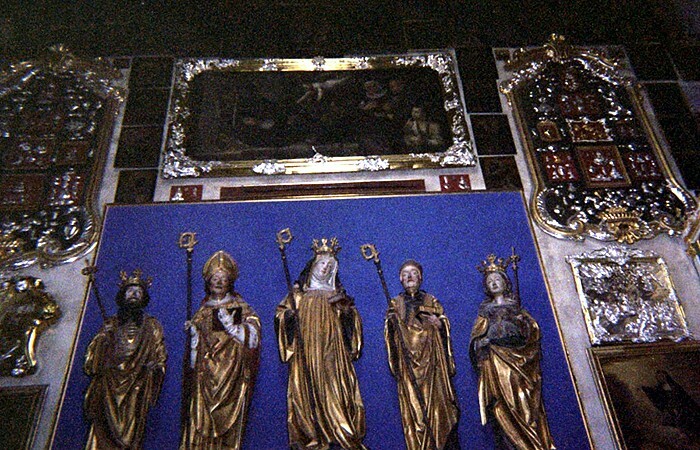 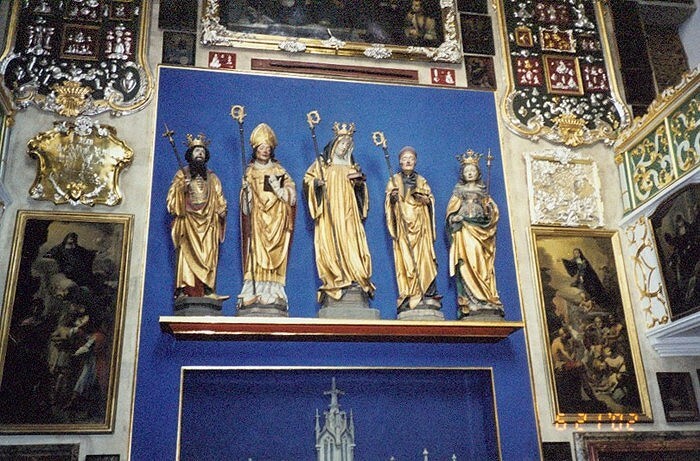 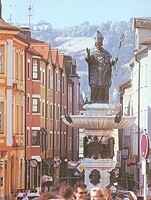 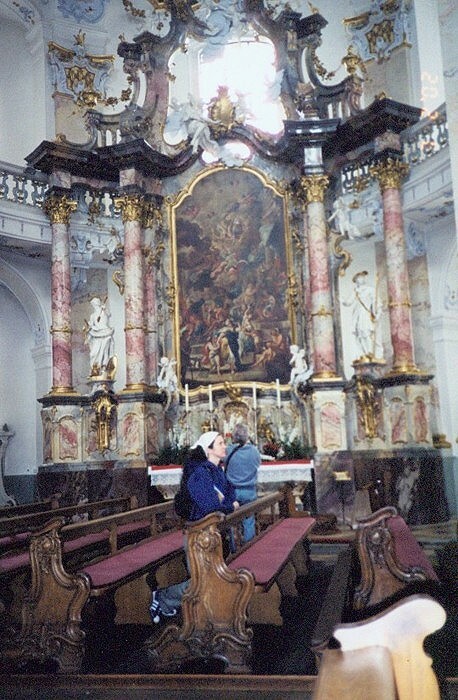 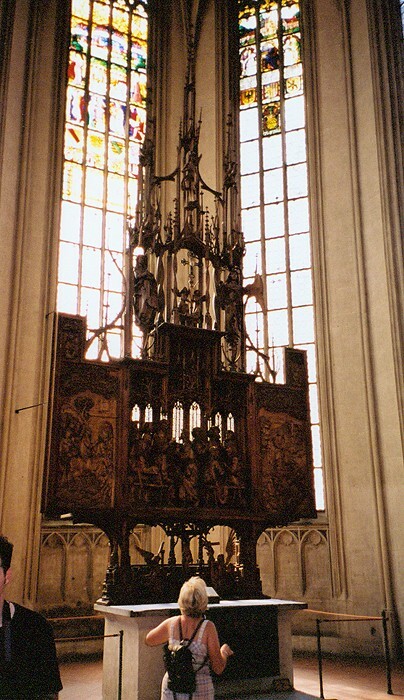 The shrine of St. Walburga. 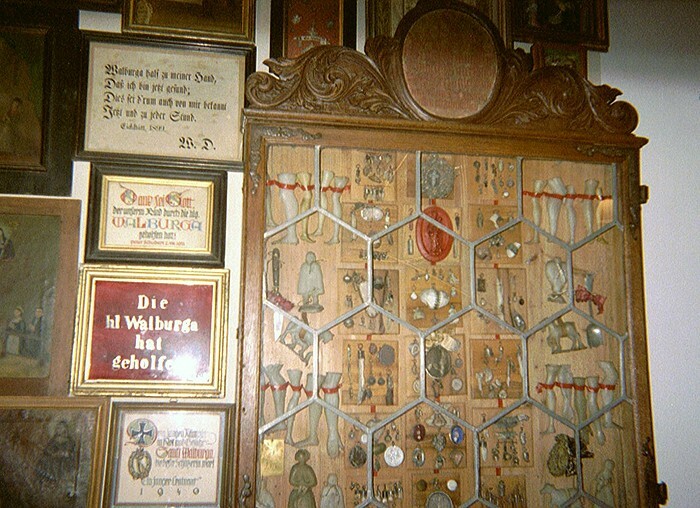 Votive offerings for graces received at the Walburga Abbey. 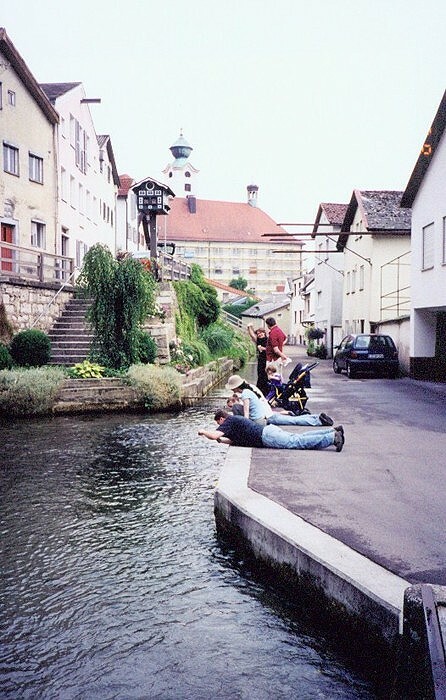 Feeding the trout near St. Walburga's Abbey. 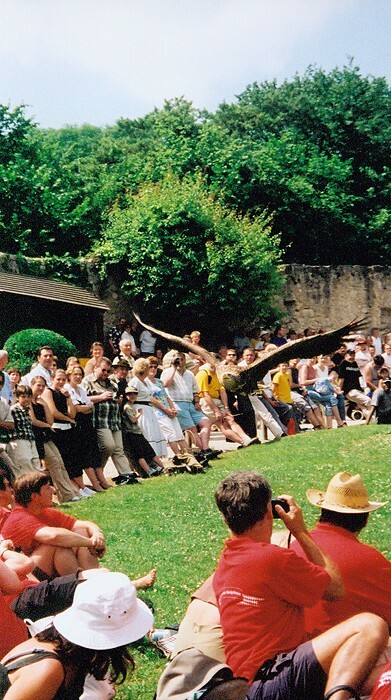 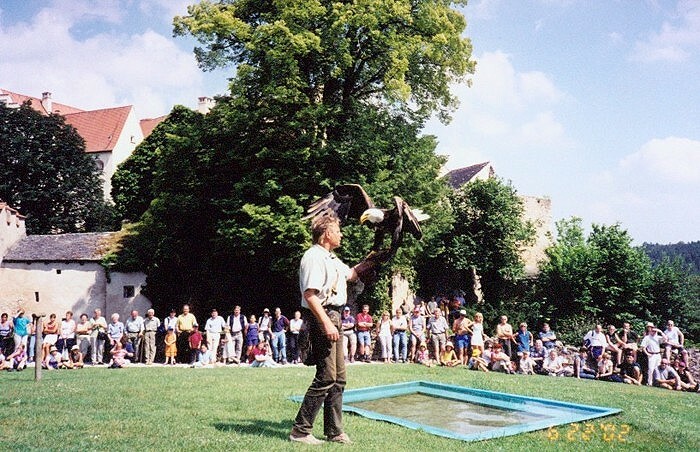 An eagle performs at Castle Rosenburg's falconry show. 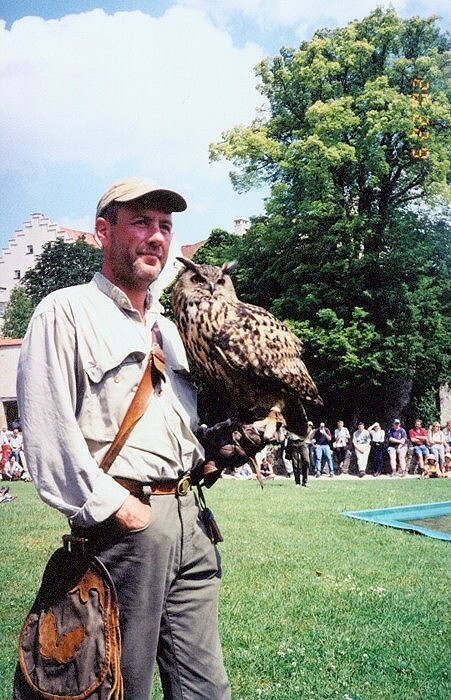 An owl at Castle Rosenburg's falconry show. 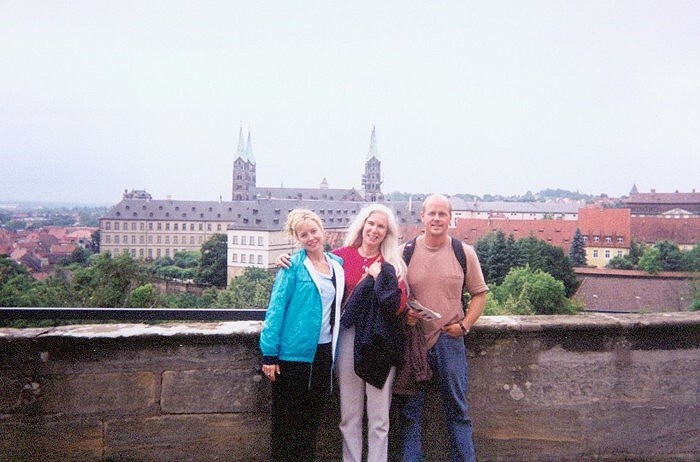 Araceli and Sonya pose at Prunn Castle. 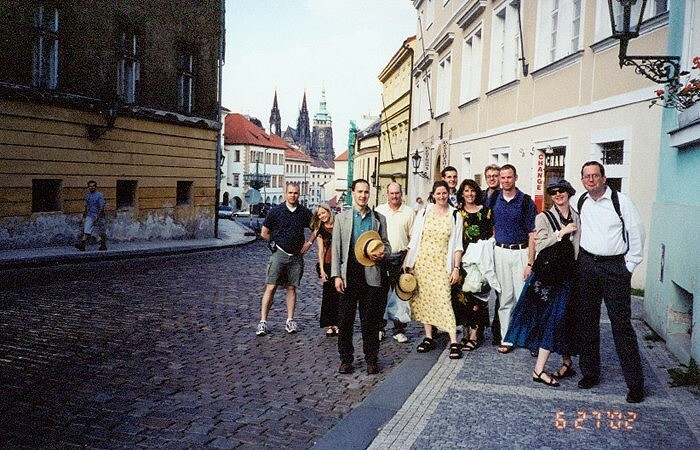 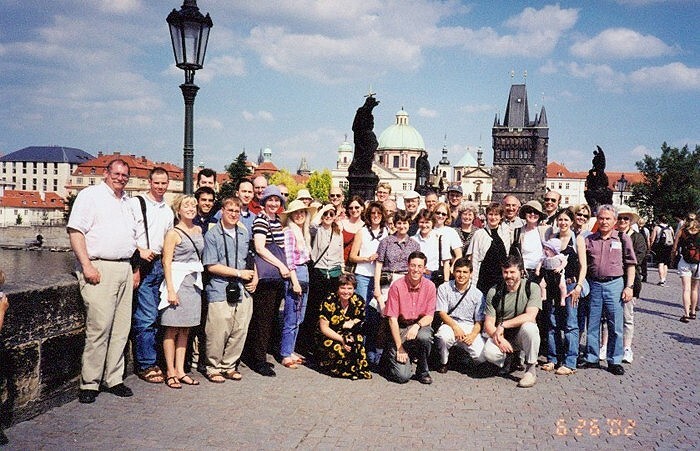 Group photo on Prague's Charles bridge. 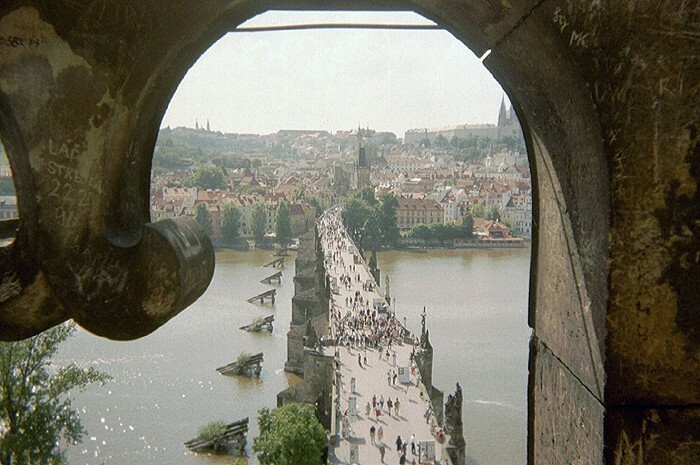 Catherine stops at the top of Prague's Nerudora Street to wonder if the leader knows the directions. 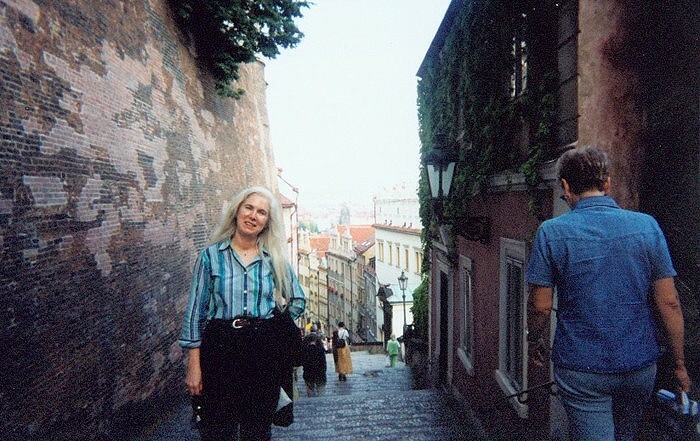 Lost in Prague's Castle district. 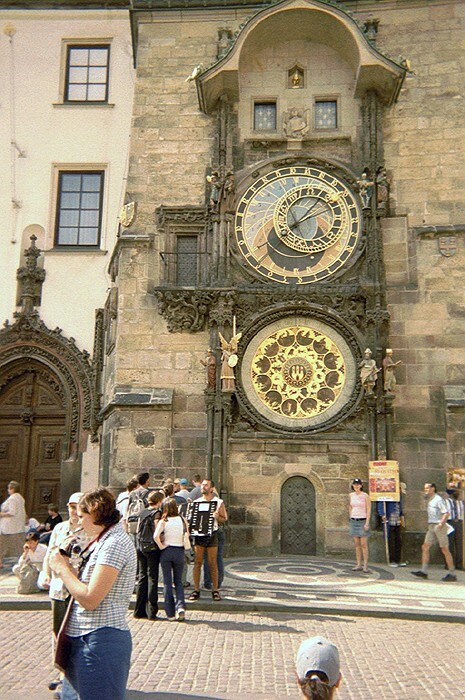 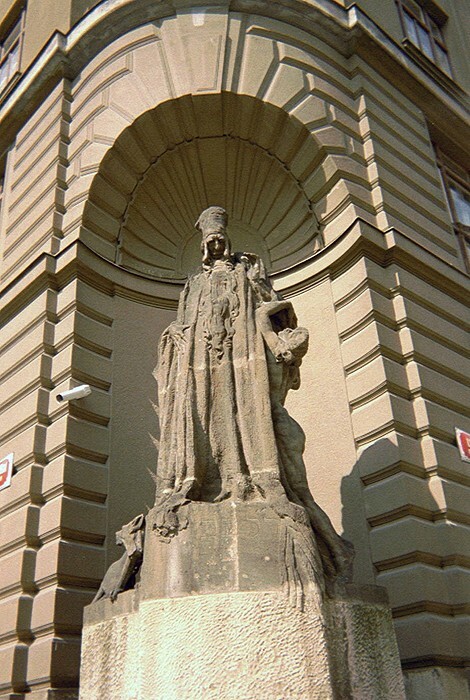 Michaela Freiora speaks about Prague's many legends. 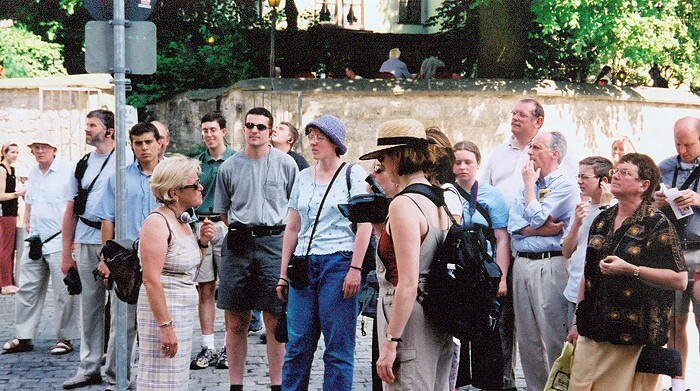 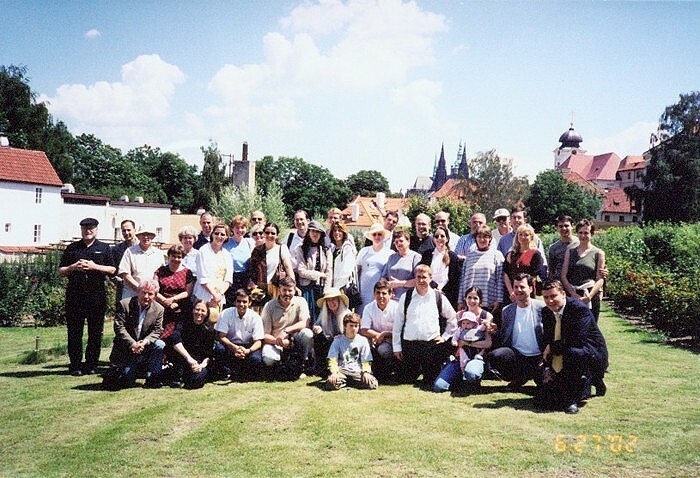 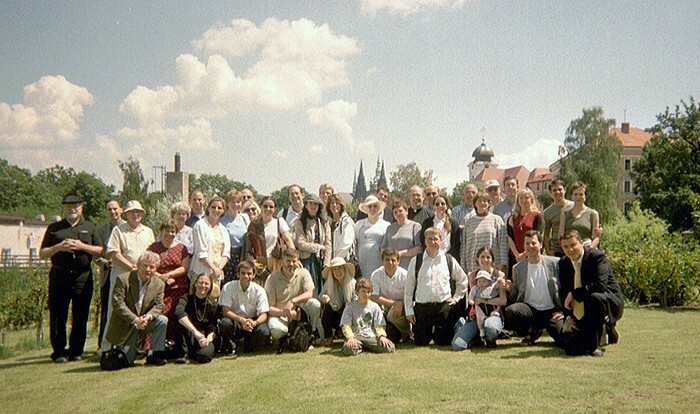 A group picture fromt he garden of Prague's Capuchin monastery. 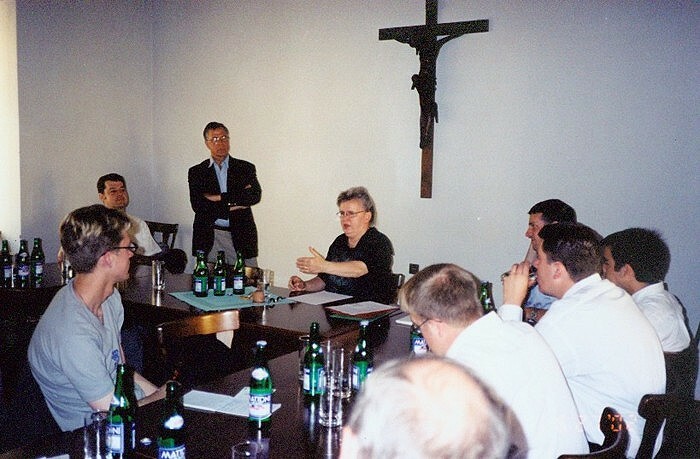 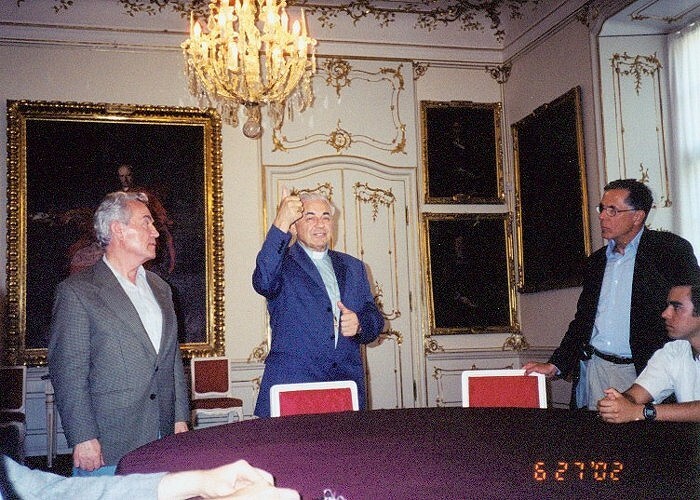 A meeting with Caridnal Miloslav VIK of Prague. 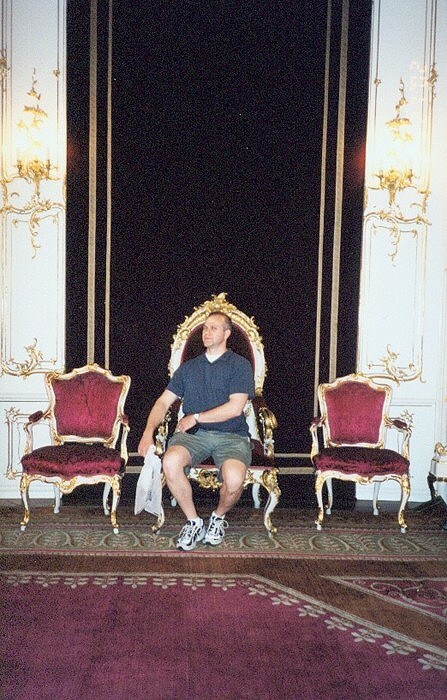 Justin dreams of a future as the next Archbishop of Prague. 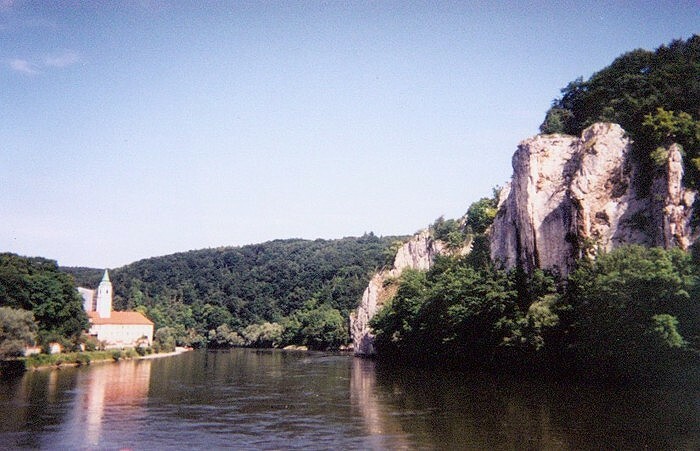 Approaching the Weltenburg monastery from the Danube. 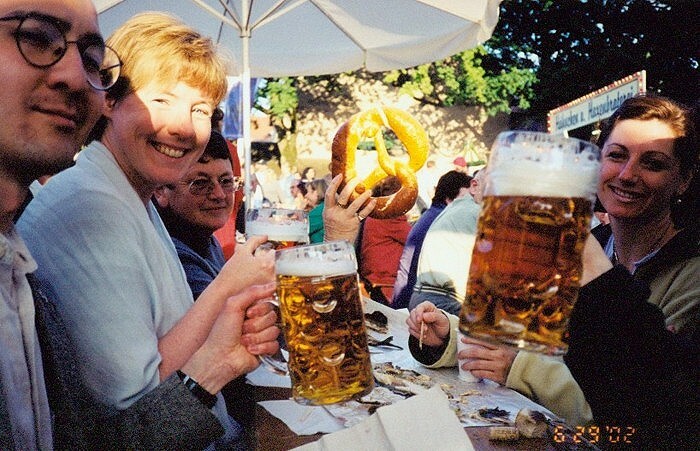 One size fits all at Eichstaett's Alt Stadtfest. 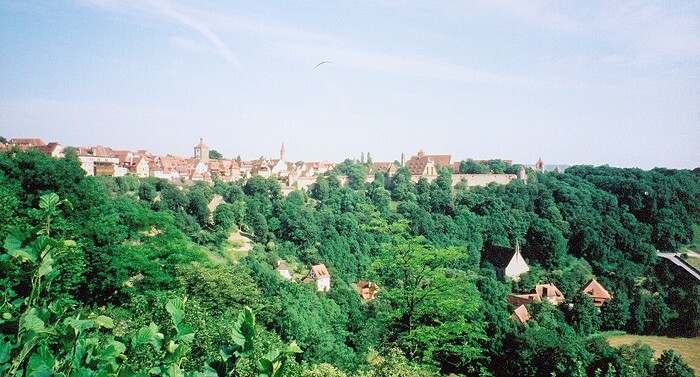 A view over historic Bamberg. 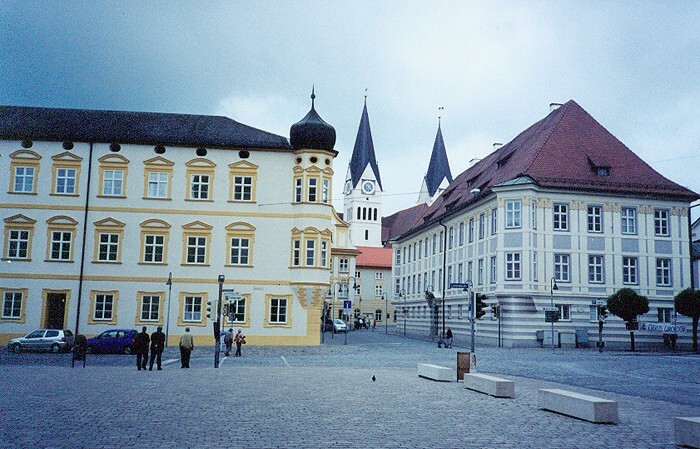 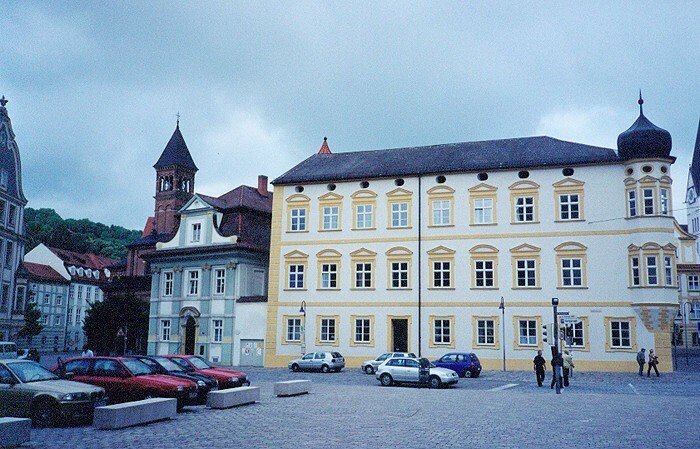 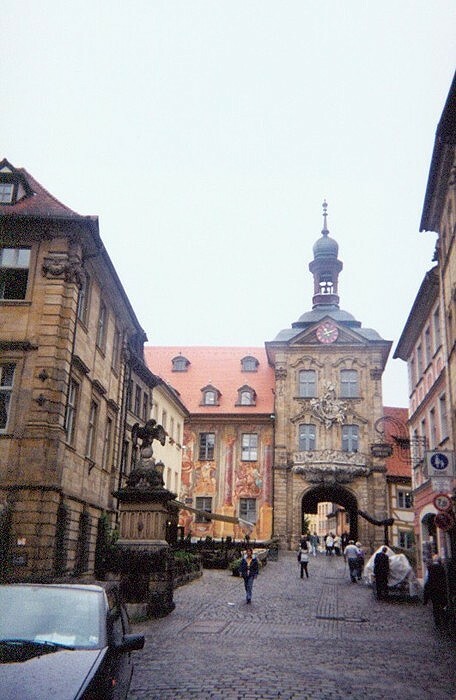 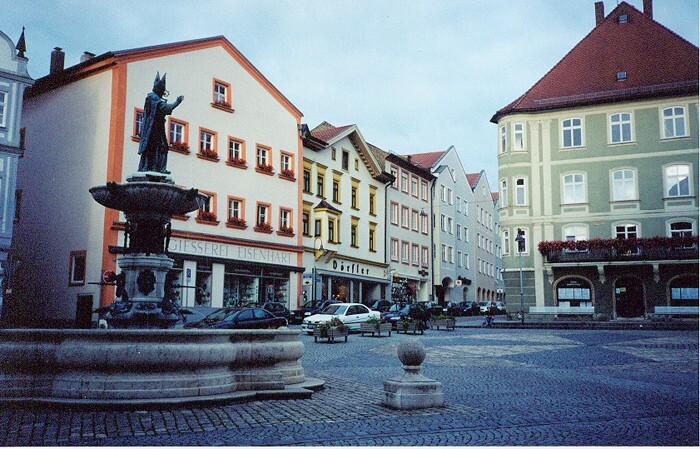 A view of Bamberg's old Rathaus. 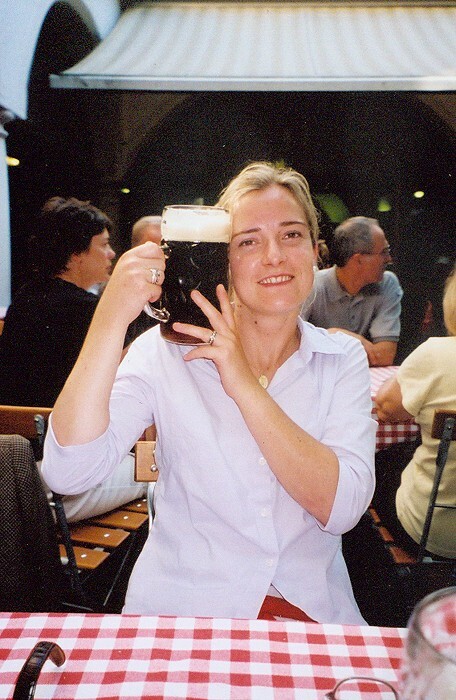 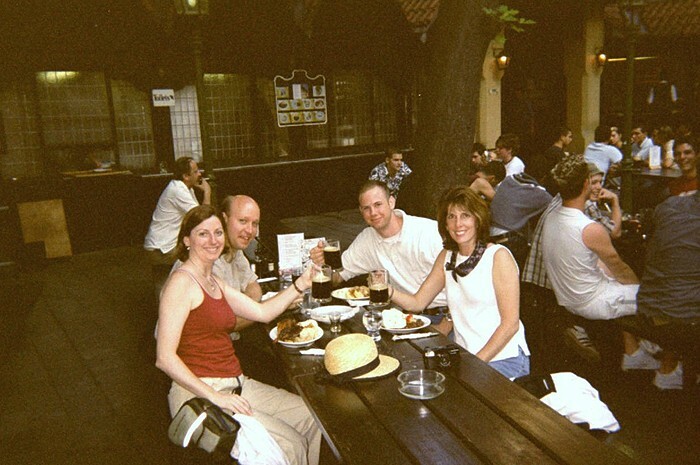 Enjoying Bamberg's famous smoked beer. 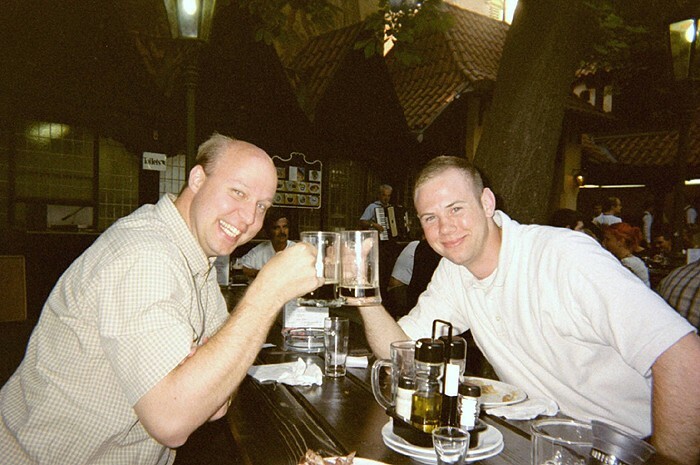 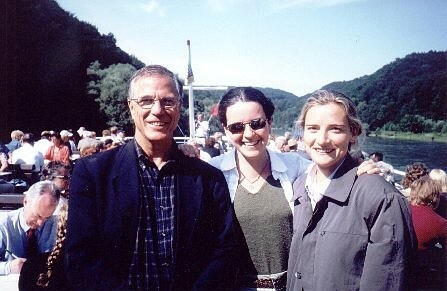 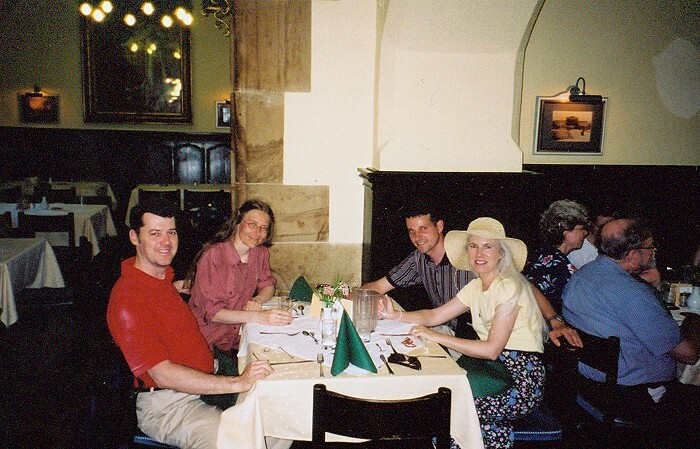 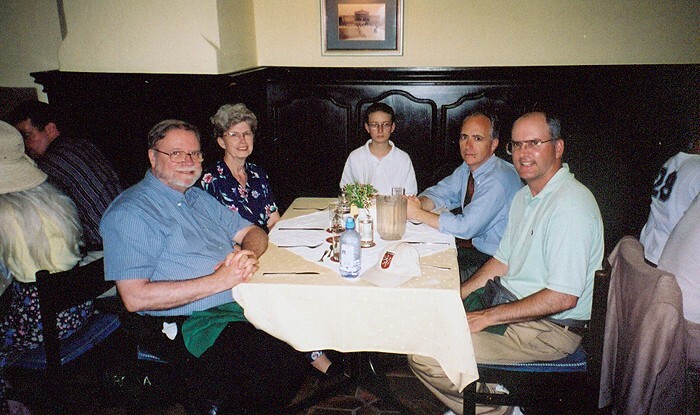 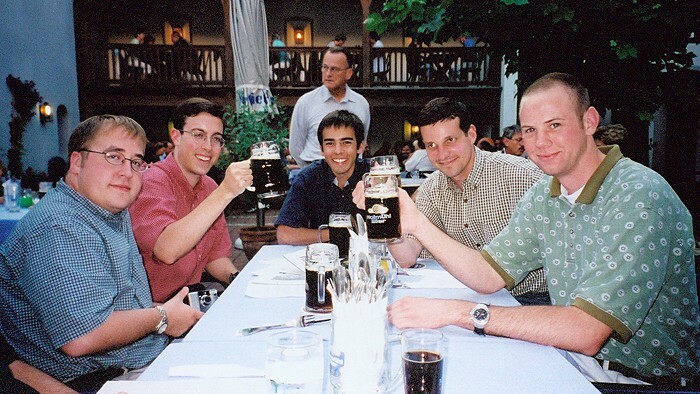 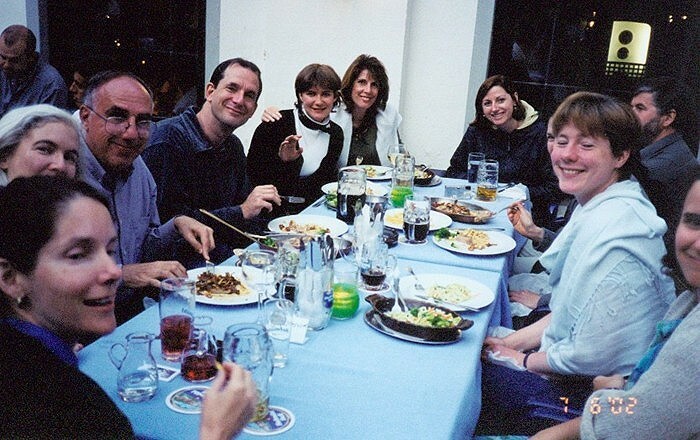 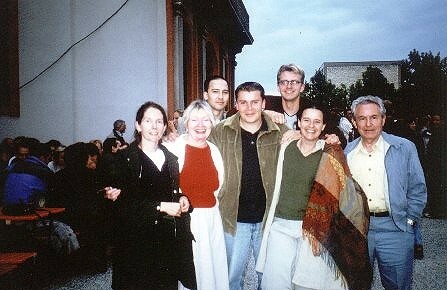 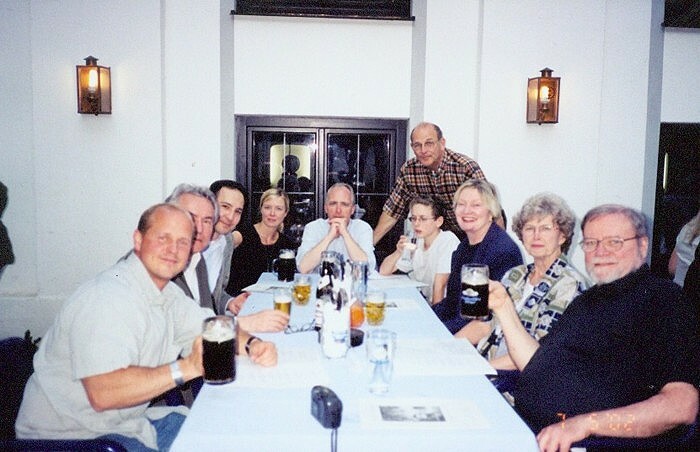 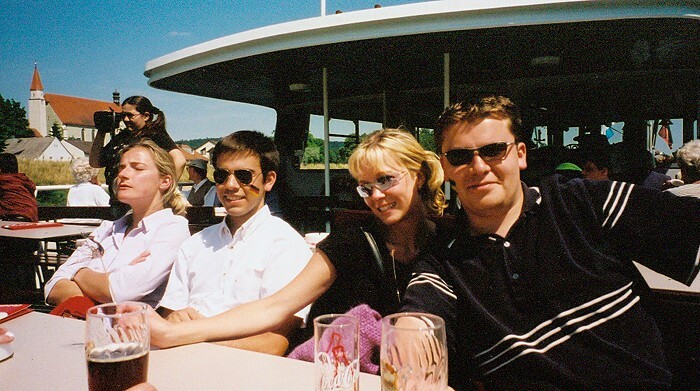 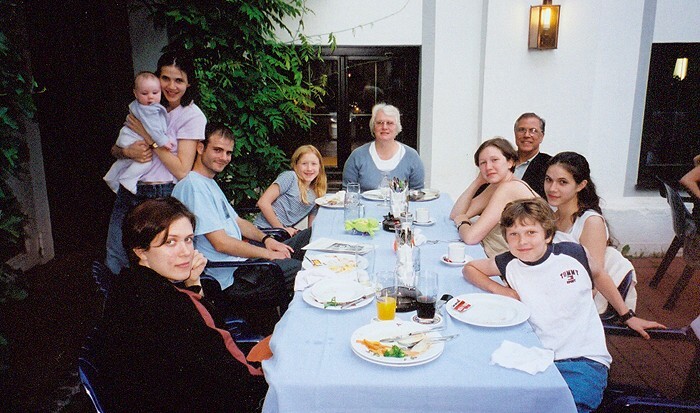 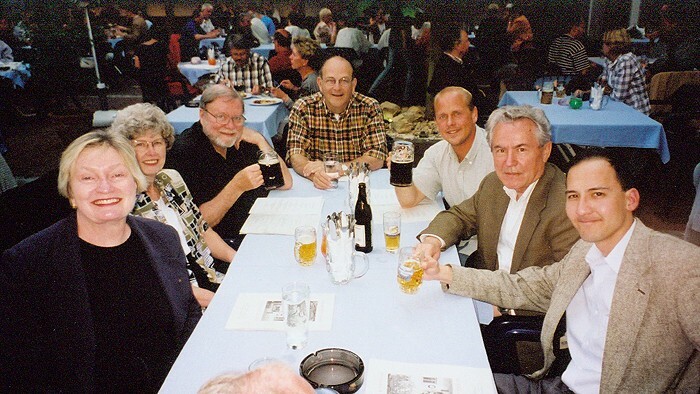 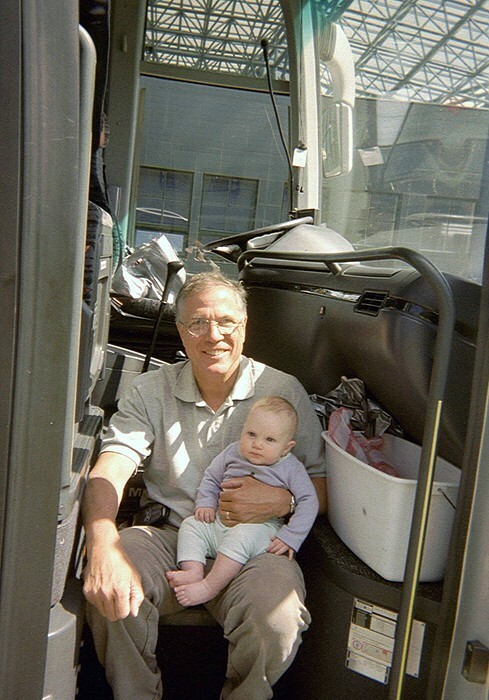 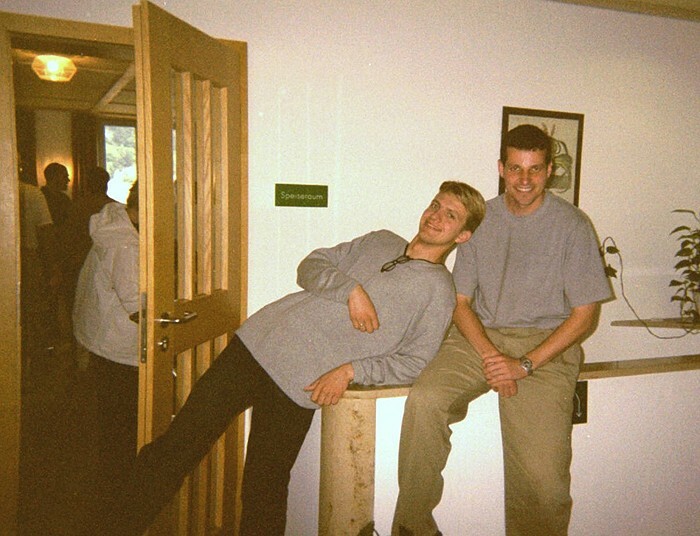 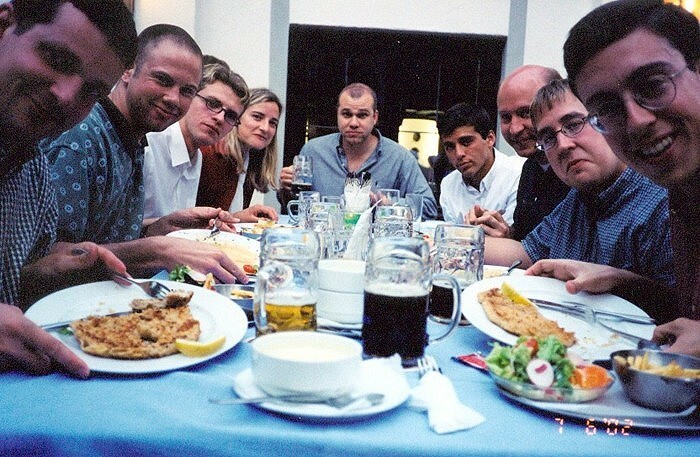 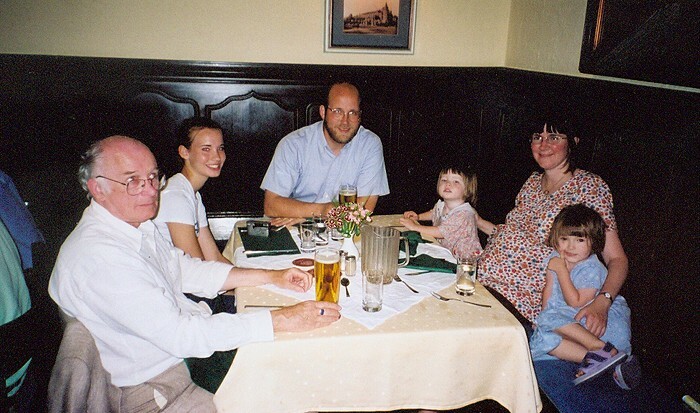 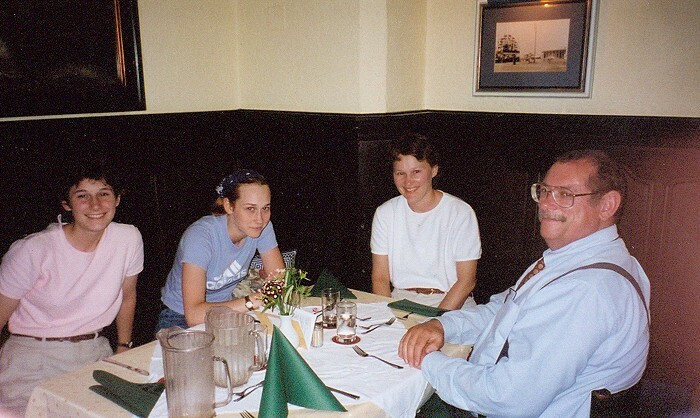 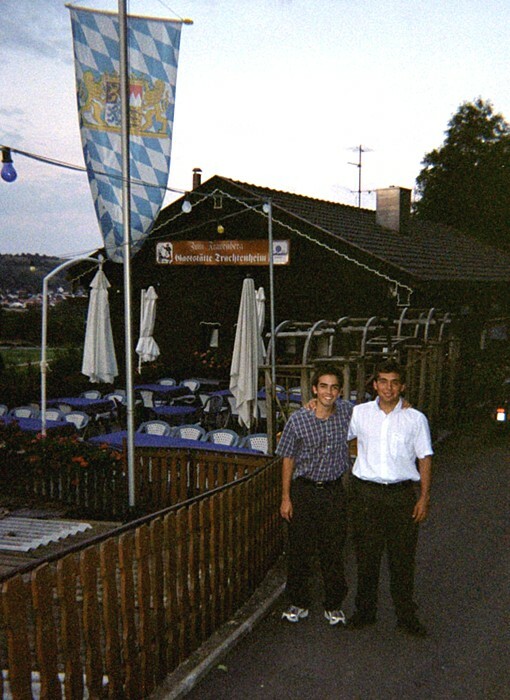 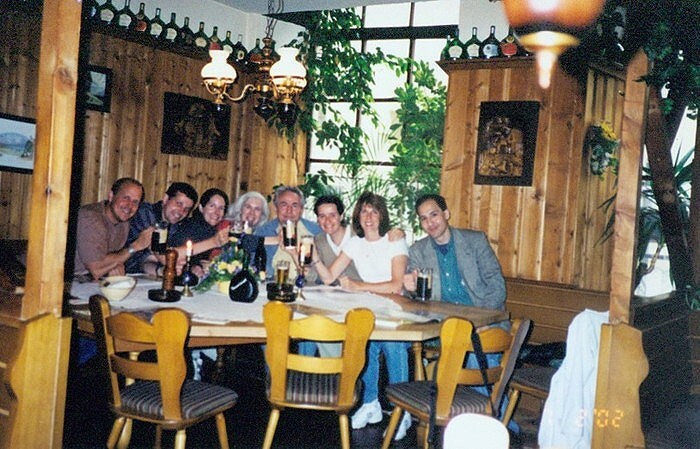 Everyone enjoying their last meal in Germany for the Summer 2002 Cultural Seminar. 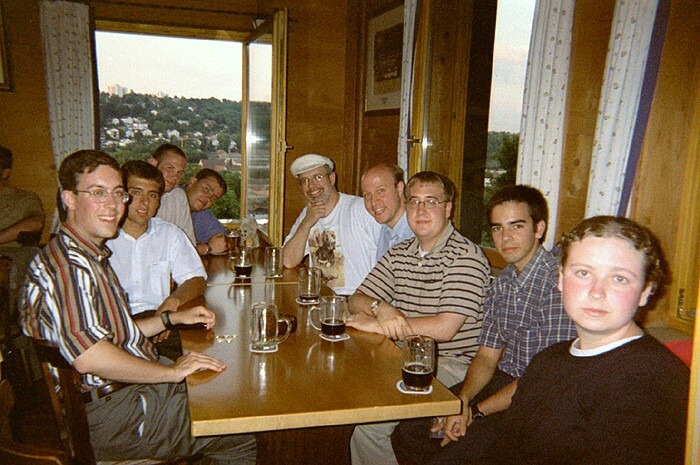 Everyone enjoying their last meal in Germany for the Summer 2002 Cultural Seminar.